‘…I’ve learned over the past few years that my job, and success to me, is connecting people with God and connecting God with people—whether that be through hands-on service, or a simple melody that I’m playing on the piano. I’m a connector, and if I’m doing my part correctly, I will disappear and leave people face-to-face with their own heart and the heart of God…’ One of the most honest, underrated, overlooked, emotive, and creative artists over the last few years, Lara Landon and her music have been ministering to people in all various walks of life, and with songs like “Beloved”, “Closer”, “The River”, “Leah” and “I See God in You”; this southern Californian native (with Arabian and Sicilian heritage) has fused together poignancy together with relatability, enjoyableness, inspiration, and comfortableness; in her songs thus far. Her new album There is Grace releases this coming Tuesday, and with a first listen, I can guarantee you that you are in for a treat- an album to certainly buy and treasure if you are a fan of Lara’s previous work, or other similar artists like The City Harmonic, Audrey Assad, Pocket Full of Rocks or Christa Wells. 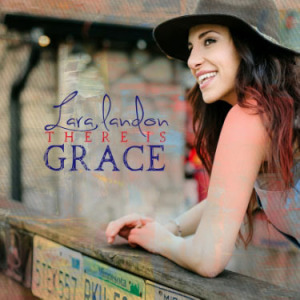 The first single and title track, “There is Grace” is one of my favourite Lara Landon songs ever, and one of my favourite songs in 2014 so far. With a piano riff introduction, Lara aims to bring us a song with the concept of grace, and remind us that God’s grace is sufficient and enough to cover everything we have done, as well as covering the sins of every soul on the planet (past, present and future) as well. Starting off the song lyrically with the question of ‘…could this really be this simple…’ is a reminder that grace is indeed simple- that Jesus’s death and resurrection was enough for us to come into His everlasting kingdom. With Lara’s serene of powerful voice and an enjoyable and refreshing piano undertone anchoring the song together as we are reminded that ‘…there is nothing I can do to make You love me more, nothing I can do to make You love me less…’; this pop melody is great for reflection, along with the acoustic version of the song as well (is it coincidence or not to see “There is Grace” as track 1, and “There is Grace (Acoustic)” as track 11?). With the overall theme of the album speaking about grace, it is indeed fitting to bookend the album with the title track. “Right Now” and “Wonderful Love” both have equal chance, I reckon, at being radio single No #2 after the title track, as Lara brings forth 2 radio friendly melodies that each incorporate an aspect of grace, shown by Lara through powerful acoustical instrumentation. “Wonderful Love” brings forth light acoustics and an easy-to-remember melody as the lyrical poignancy hits home in the heartfelt chorus of how ‘…what could separate me from Your love, what a love, what a wonderful love, when on the cross it was me You were thinking of, what a love, what a wonderful love…’; while “Right Now”, a duet with worship leader Jaye Thomas, brings a moment of surrender and reverence as the piano led melody reminds us all that ‘…right now, I feel Your love surround me, right now, You wrap Your arms around me…’, with hopefully us as listeners feeling comfort, not only in this song but throughout the album as a whole. And with both Lara and Jaye singing great harmonies, it’s no wonder Lara brings forth more duets on an album that’s one of the most underrated albums of 2014 so far. Friend and singer/songwriter Morgann McClanahan raps on fun summer song “California Waves” (Morgann raps pretty well, I initially thought she was Jamie Grace for a second), and while at times it may seem odd for a song about summer, surfing, the West Coast of America and having fun being placed in an album full of faith themes, Lara does remind us of our need to take things slow and not to stress out- if this song is what it takes for us to focus our hearts and eyes on God during our times of busyness, then I’m all for it. With beach sounds, seagull noises, and a ukulele, Lara brings us a theme of friendship and stability in one of the most unique and interesting songs on the album. Friend Garrett Miller lends his voice on duets “Home” and “I’ll Be Your Friend” and with Lara bringing forth themes of coming home from a lifetime of dirtiness and despair (“Home”) and responding to God as we allow Him to be our friend, Saviour and everything we need (“I’ll Be Your Friend”); both these melodies remind us that reflective slower paced music is just as poignant and enjoyable, maybe even more so, than the much more radio friendly material on the album (“There is Grace”, “Right Now”, “Wonderful Love”). With acoustic guitars and serene vocal harmonies traded by both Lara and Garrett, it is the technique of singing from God’s point of view on “I’ll Be Your Friend” that brings us much more into the emotion of not only the track but of the album as a whole as well- that once we feel how much God loves us, we can respond out of that and believe with our hearts that ‘…when the night falls, you’re not alone, I am watching over you…’ (“I’ll Be Your Friend”). Throughout the rest of the album, Lara continues to bring us emotive themes and heartfelt melodies that impact us and bring us to action as we allow ourselves to be transformed by these songs that are possibly some of the best Lara has ever recorded. “Beautiful Eyes” is ‘radio friendly’ written all over it- nothing against it- it’s a great song as we see Lara bring a theme of us looking at the face of Jesus in all His beauty, but if you can tell a song is fit for radio within its first few seconds, then the song is sadly not bringing us something that we as lovers of music are yearning for- something different and creatively unique. “Courage”, a nearly 3 minute piano only song, is an example of something creatively different- a melody that speaks volumes without words- I can tell that Lara may have had to had courage to record the track. Which is understandable- considering her father’s unexpected passing in early August 2014. With the song “Want to Know You” now dedicated to him, the four minute melody reminds us all to continue to cultivate and strengthen our own relationships with our families. Lara’s newest album is one to be enjoyed, treasured, loved and celebrated if you love Christian music, but not necessarily the similar music on Christian radio a la K-Love or Air1. While still radio friendly in a few parts on the album, as a whole Lara has carved a collection of songs that seek to stretch us musically as we are brought out of our comfort zones to see what Christian music, not just CCM radio friendly music, has to offer. As we are reminded through the album as a whole that ‘…the world is turning, don’t miss it cause you’re standing still…’ (“The World is Turning”); Lara’s quest to deliver a set of songs that challenge our faith as we solidify what we believe in is certain true in this music offering. An album that’ll be one of my favourites in September 2014 (alongside albums from The Walls Group and assumedly Lecrae and for KING AND COUNTRY), this is arguably Lara’s best album to date! Well done Lara for such an inspired and enjoyable album experience.